Africa's Ultimate exhibition, Propak Africa 2019 was a wonderful experience for food, Pharma, FMCG, Mineral & metals and many more industries. The exhibition was hosted at Expo Centre Nasrec, Johannesburg, South Africa from 12th to 15th March 2019. It is the best platform which attracts many industry leaders and assisting them with 600+ exhibitors from the food processing, packaging, plastic & Sieving & Filtering services. Galaxy Sivtek is the largest manufacturer of Sieving and Filtration equipments. Holding the batch of assisting more than 1200+ brands & ISO 9001-2015 certified company which is known for its quality made Vibro Separators and Self Cleaning Filters. 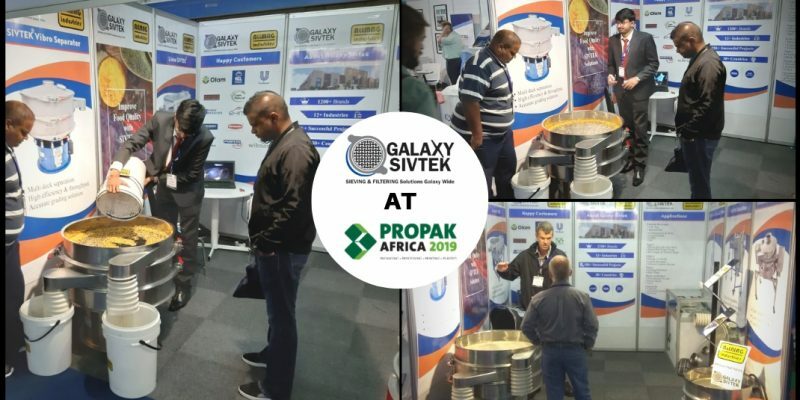 Galaxy Sivtek is the premium partner of Propak Africa and taking part in the expo for a long time. This time Galaxy Sivtek made its presence on the Stall: 7C1 to help processing industries to ease their Sieving and Filtering operation. Galaxy Sivtek sieving experts were gathered at the stall with high tech screening solutions which will give you high throughput and high-efficiency results which no other sifter or filter can provide. SIVTEK products are made as per the cGMP and US-FDA norms, especially for the food and pharma industries. A contamination-free product is the first preference when comes to deal with edible products. Galaxy Sivtek is best at it. It provides high-end sieving system which is made from tough stainless steel & mirror finished for smooth material flow. Galaxy Sivtek also helps you to manufacture ferrous-free material by its magnetic belt separator. At some processing stage, it is necessary to remove ferrous particles. otherwise, it will drag the material quality down & gives a huge loss on the name of the brand. Mr. Keyur Andharia, Manager - Export Sales | Galaxy Sivtek, concluded that Galaxy Sivtek belives in "Customer Satisfaction" We are having our own largest product trial facility at our premises. Therefore you dont have to blindly purchase a vibro sifter unless and until you are fully satisfied with the result and performance of the machine. The relation has not ended here - It is the beginning. Our 24X7 support will guide you to achieve high-quality whenever and at whatever stage required. You are just a call away from our sieving experts. If you have missed the chance of getting in touch with the expert. Contact us and learn how we build the future of sieving and filtering your products. We are Galaxy Sivtek! & we are "Committed to Quality and like every time Committed to You".